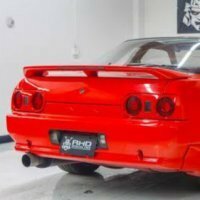 I thought I would share my experiences modifying an Auto R33 GTS-25t since Im nearing the end of my modifying experience. Well the cams definitely makes some difference, More power for less boost. Thats always good. DAMN THESE SERIES II COILS! Not sure how much boost I should be running with stock internals, or how much the turbo can supply before running out of efficiency. The turbo is too small, restricting exhaust gas flow, making the stainless manifold glow red hot with superheated air, looking for something slightly bigger in the future, but even with this much power, traction is an issue not sure what can be done. Cant wait to hit the 1/4 mile with the mickey thompson. First gear is actually usefull again! 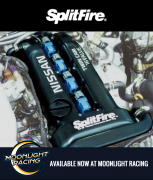 I also plan to do my Auto S2 R33 up abit (180-200rwkw goal) and your post has been informative in telling me what I need to modify to get it. 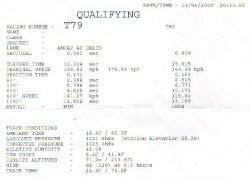 What do you think you would've got on the dyno after step 1? Interesting result, still appears to hold power well to redline. Does it feel as if it wants to rev to 6.5k still? Next time your down at your new tuner have him give it a quick power run in SHOOT6 or SHOOT6F mode. Most likely you will see a small increase in power. It will then be comparable to the last one done on SST's. Interesting about the HKS2535 turbo , they're supposed to use a compressor in between the 2530 (60mm) and 2871/GT-RS (71mm) . I think HKS blurb quotes 69mm 84T so probably the closest available compressor for the high performance GT28 turbine . If you can read the turbos ID tag may I have its numbers please . Also if you remove it some pics would be handy . Do me a favour and delete all references to boost cut, there is no such thing, The standard R33GTST ECU doesn’t even know what the boost is. It is excessive airflow as noted by the AFM which sends the ECU in to rich and retard mapping. Call it "R&R Mapping" for short. I love the way the turbo runs out of airflow and can’t hold the set boost level. I noticed that you have used the standard RB30 conrods (did you also use the standard RB30 rod bolts?). If so, I wouldn’t be going much over 300 rwkw (400 rwhp). best of luck with the rest of the upgrades! I noticed in your last step you went to a different exhaust manifold. Is it a high mount or low mount and does it have the same type of heat sheilding as the factory item? 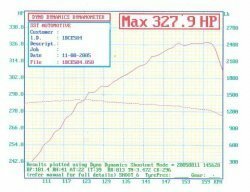 I ask as the last dyno chart posted has an inlet temp of 55degrees, nearly 30 over ambient where it doesnt happen that far previously. IT of 55 just means the sensor is where Dyno Dynamics suggest it to be. For a Turbocharged car however, its essentially useless. Steve told me about your car lukits01 as im thinking of going the HKS GT2535 turbs on a rb30det aswell (have it on the 20det). 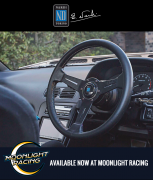 Whats it like to drive? boost come on like a jet? 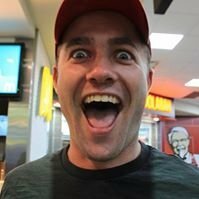 I hope Lukits01 doesnt mind, but i though i'd add my mods and progress to his thread to keep it all in one spot... just let me know if you want me to start a new one mate. 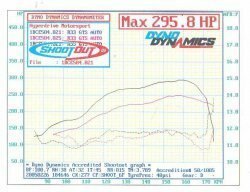 I've attached a graph of combined dyno runs i've done as i changed things, all on same dyno, all tuned by me. 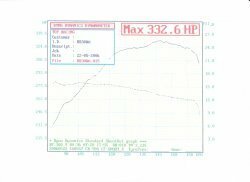 The BLACK line is as i recieved it ... (on this dyno std r33 autos are about 115 rwkw) , this had a Fujitsuboto "jasma" spec cat back and a 3" full dump fitted and a pod filter. So it had abit more that a stocker. The GREEN line is LINK plug in computer, converted to MAP sensor, Splitfire coils. Boost was 11psi rolling back to 9 psi from midrange onwards ( Using the links boost controller to roll it off, as trying to maintain 11 psi actually closed the wastegate sooner and power dropped off... by asking it to do lower boost the gate stays open and power stay higher for longer) , R34 GTT SMIC upgrade. 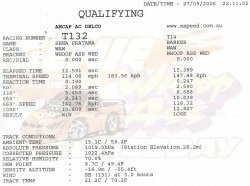 ran a 14.3 @ 98MPH 2.95 60' ! 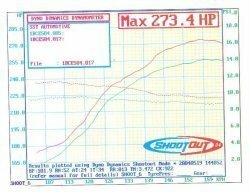 The PINK line is Hiflow turbo (VG30 rear housing, new turbonetics center, Garrett Stage 3 To3 Turbine wheel, Rx-7 front cover with a V-trim hiflow wheel (6 blades not 8 like the V1/V2 has) , 550cc Nismo injectors, MV Automatics Shift kit, FACTORY Airbox fitted, with Apexi filter. Bosch 040 intank fitted. Power was abit lower than i expected, even limited by the cooler size, so i checked the exhaust back pressure, and to my horror saw 11 psi BP on 12 psi boost. !! The RED , YELLOW & BLUE lines. Just removed rear muffler, and welded on a temp cannon cheapie (2 new SMB's on the way soon) .. Got to 207 rwkw doing constant ramp runs with changes etc .... , then let it cool and did the final run in BLUE.... So fair indication a front mount cooler would help lots to keep the power constantly around the blue range, would dare say it would be back the the red area 1/2 way into a drag run. I just cant get it off the line.... tried all different styles 60' was very consistent between 2.59 to 2.68. Cooler will definitely give you a big gain and more consistent power runs and ARC coolers are suppose to be one of the best, wish that was available when I was looking arround for coolers. Cams really only needed when you change turbo or if you want that little bit more midrange. I just happen to come accross my set 2nd hand relatively cheap so I went for it. Torque is multiplied though the gearbox ratios and the diff ratios when running on a dyno. Hence not comparable to engine torque quoted by manufacturers. Yeah its in Newton Meters, and as Gary has pointed out , its rear wheel torque, not motor torque. Yes i think the cooler will help immensly.... Does anyone reading this know if the ARC coolers are able to fit without cutting the reinforcement bar whatsoever ..?? I just like my insurance thats all. I ended up getting a genuine Hybrid GT cooler (after much searching for a genuine distributor, wayyy to many fakes around!) Decided i didn't want to spend over twice as much for the arc, plus the ensuing wait from Japan. Also just spoke to Mike at MV few minutes ago and he's finally got a spare converter out of a R31 he can mod and send up for me to swap over, as i didnt want to pull mine out and then wait to refit. Exciting ! I'll try to have it all in by the end of month, before next circuit sprints.